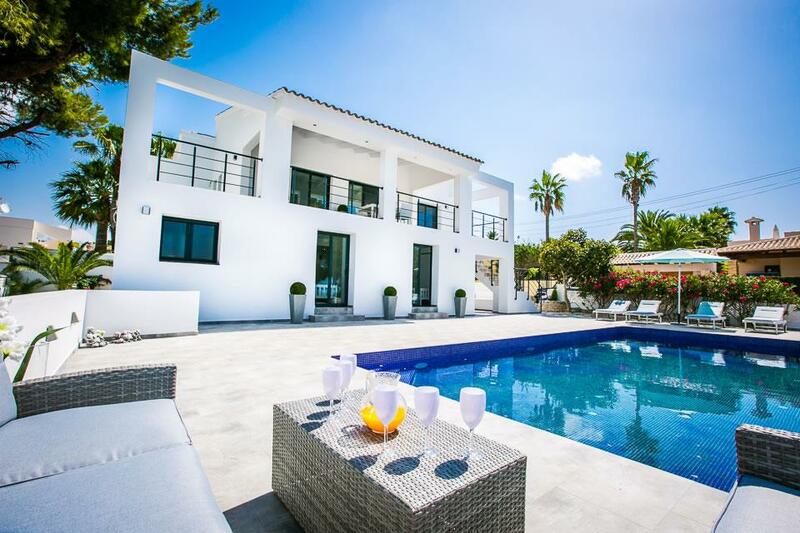 A stunning contemporary 5 bedroom villa in a much sought after location adjacent to Moraira's Ifach golf course and just a short walk down to Pepe la Sal and all of the nearby bars & restaurants of San Jaime. Beautifully presented, ultra modern, features include pool table, sea views and an infinity pool as well as ample outdoor seating for dining or relaxing. All of the bedrooms have air conditioning and WiFi internet and UK FreeSat television channels are also provided. 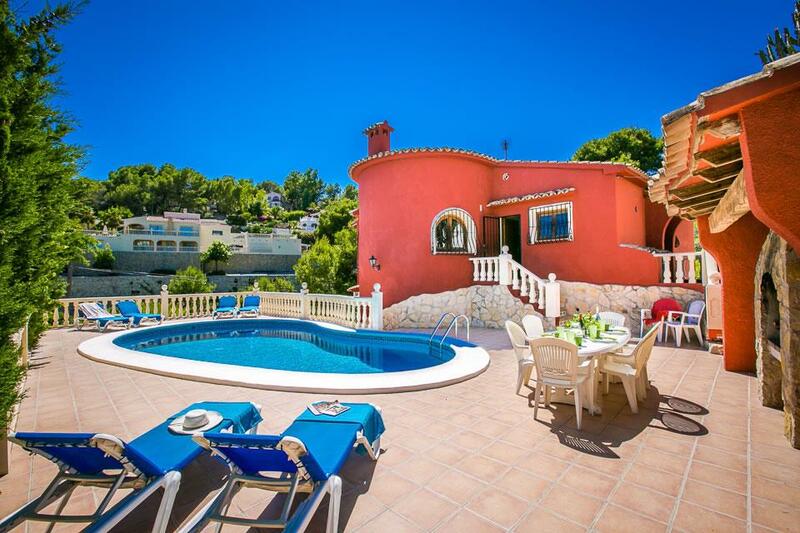 Walking distance to a great choice of amenities and even the centre of Moraira. 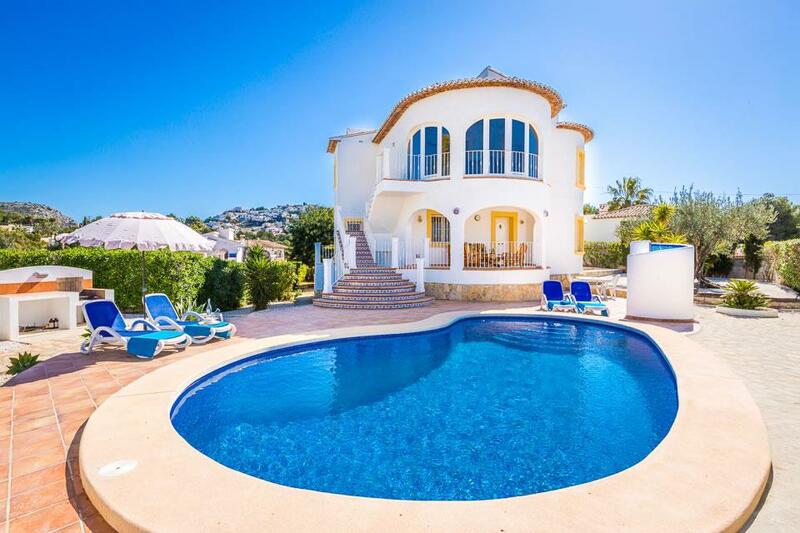 Villa Los Niños is a modern villa that offers spacious open-plan living in a peaceful and tranquil location that is conveniently situated next to Moraira's Ifach Golf Course and the great choice of restaurants, bars and shops available in the San Jaime area. 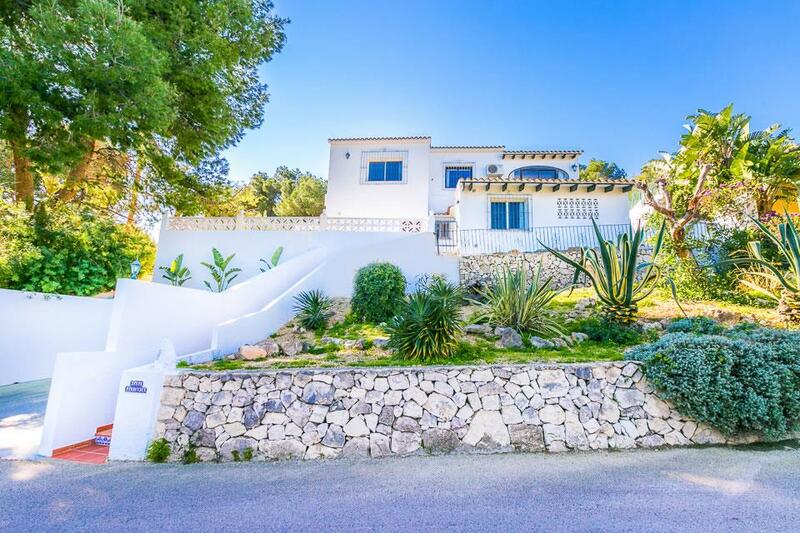 With the coast road within easy reach it is possible to easily walk all the way into the centre of Moraira on the coastal road pavement overlooking the sea for much of the walk passing numerous restaurants and bars along the way. Ultra modern and very well specified throughout with new furnishings and fittings the spacious pool terrace has an incredible 10m x 5m infinity pool, sea and valley views with the mount Ifach in the background are particularly good from the upper floor terraces and living areas. Air conditioning is provided in all bedrooms, Wifi internet and UK FreeSat channels are also provided. Highly recommended. On the South-facing front of the villa, steps lead from the private gates onto the driveway, from here a few more steps lead up to the upper terraces over-looking the infinity pool and pool-side terraces below as well as a breath-taking vista. This large L shaped terraces has three sets of bi-fold doors leading into the upper floor accommodation. Entry leads into a large modern dining room, lounge and kitchen. The villa has a very well-equipped and modern kitchen with electric hob, electric fan oven, fridge/freezer, dishwasher, microwave, coffee machine. The comfortable living area features LED television with UK FreeSat channels & DVD player and also WiFi internet that can be used throughout the villa. A staircase leads down to the ground floor which offers a total of five bedrooms and three bathrooms. There are two double bedrooms each with built in wardrobes, air conditioning and en-suite bathrooms. There is a further large double bedroom with a king size bed, air conditioning and built in wardrobes. There are also two further bedrooms with twin single beds, both of which also feature air conditioning and built in wardrobes. These three bedrooms share the beautiful large main bathroom with contemporary bath. Most of the windows and sliding doors feature sliding mosquito nets. Outside the large, minimalist gardens features palms, and pretty flowers. 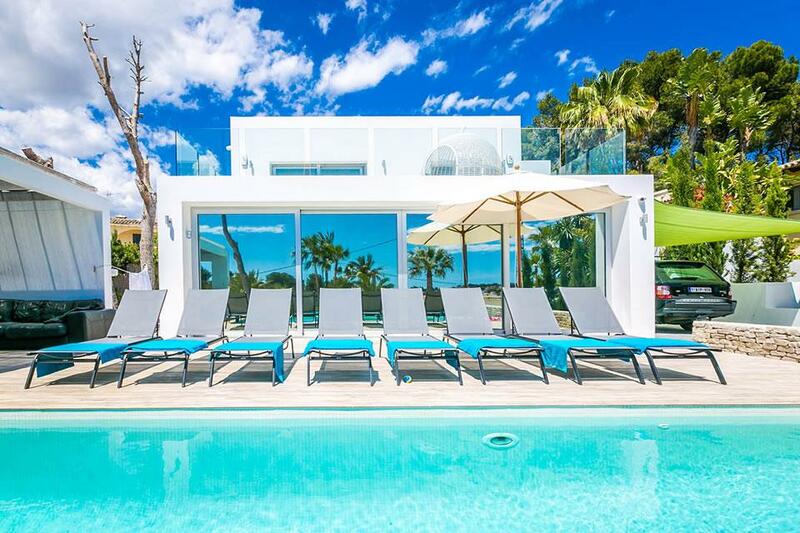 To the side and rear of the villa, there is space for up to 4 cars to park and the stunning pool-side area features a 10m x 5m infinity pool, six sun loungers, a shaded sofa seating area still in view of the pool. The BBQ area comprises of a barbecue, and plenty of seating for Al Fresco dining. Due to the quality of furnishings and fittings at this villa an extra refundable deposit of £500 is required against accidental damage. Subject to a villa check this deposit will be refunded within seven days of the end of your holiday. 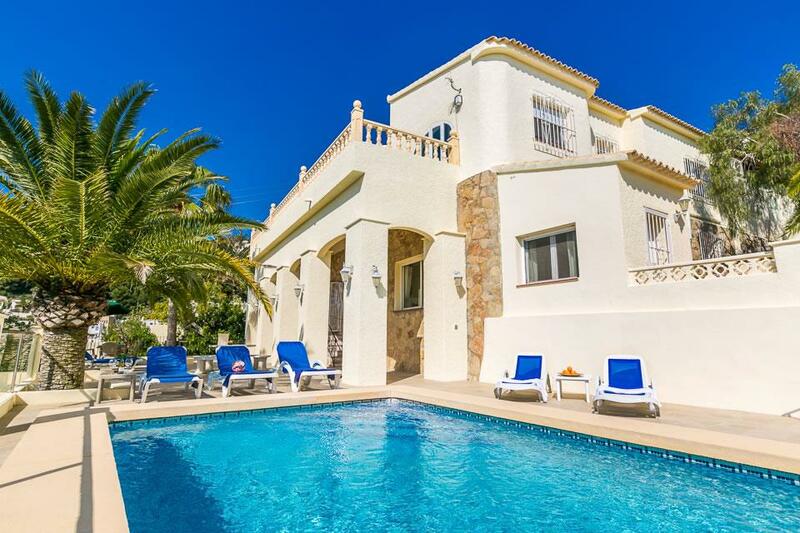 Fantastic villa with great views and pool/BBQ area. It is furnished in a very modern contemporary style and with 5 bedrooms lots of room. Slightly lacking in some of the expected cooking utensils and bedside lights in the bedrooms would be easier than having to get out of bed to turn off the lights! Beautiful villa, excellent location very peaceful and quiet. Moraira is stunning. Loved everything about the place. Great family holiday, will definitely return. Lots of lovely places to eat. The villa was well equipped and clean. Pool was delightful. Beautiful view from the balcony and a great place to sit and socialise of an evening. Very well thought out design. Great for families of all sizes.